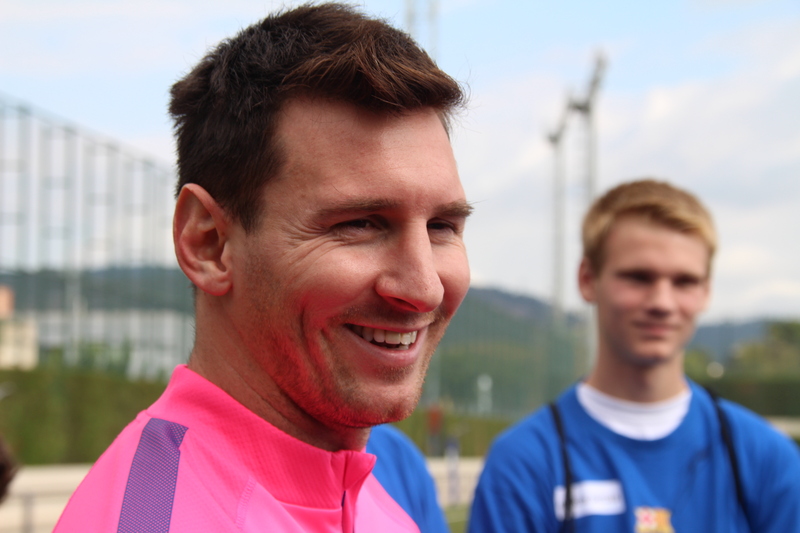 Travis Meets Leo Messi Thanks to Make-A-Wish! 10/28/2014 | Travis the Warrior --- Kickin' Cancer! On Tuesday, the bus picked us up at 11:00 am and we were on our way to the FC Barcelona training facility, Ciutat Esportiva Joan Gamper, which is also where La Masia (FC Barcelona Youth Academy) is located. We all went into the reception area and the kids had a chance to sign a poster of an atlas with FC Barcelona Shields on all the places that the kids came from around the world. Travis signed “Dear Messi, Thank you for taking the time to be with us. Travis Selinka – Carlsbad, CA – Travis the Warrior.” The kids were then called to go out to the training field and when they entered they started a little soccer game before Messi arrived. What else would you expect from a bunch of soccer fans? When Messi entered the gate, all the kids cheered for him and chanted “Messi Messi Messi.” At that point, Travis said: “I was amazed that my wish was actually coming true and I was meeting the world’s greatest soccer player.” The kids gathered together for a group photo with Messi and presented him with some gifts. Travis presented a gift of Travis the Warrior t-shirts and a wrist band for Messi and his son. Messi asked to watch the kids play soccer so they started playing their game again. Messi wanted to join in but he was recovering from an injury that occurred during El Classico against Real Madrid the previous weekend. After the mini game, the kids gathered together around Messi and were able to ask him questions. Travis’ question was, “Was it hard when you had to have growth hormone shots when you were little?” Messi replied in Spanish which was translated to “I always looked forward to playing my next game and that’s what got me through. I didn’t let that get to me.” Another kid asked him, who his favorite player was growing up and he replied: “There are so many good players it’s hard to pick one. If I had to pick one, it would be Maradona”. Another question was what was his hardest match and Messi replied: “Every match is my hardest match.” It was great that Messi just interacted with the kids so freely. After the question and answer session, Messi posed for one more group shot before he handed out FC Barcelona swag bags and the kids loved them. Click Here for the story on the FC Barcelona Foundation website (click the picture for a short video). Click Here for a YouTube Video link of the Meet and Greet. Click Here for an article from Soccer Nation covering the story. Thanks to Make-A-Wish San Diego, Make-A-Wish Spain, FC Barcelona, FC Barcelona Foundation, Leo Messi Foundation and Leo Messi himself for making Travis’ dream come true! Stay tuned for more to come from our tour of Camp Nou and FC Barcelona game! That is awesome news Travis. We are all happy for you. Great pictures!